LOS ANGELES — You think this is some minor tweak, some neat public relations bump in tough times or even just signaling the end of Jim Buss’ tenure in charge of the Los Angeles Lakers’ basketball operations? Magic Johnson has some no-look passes to show you. There’s much more to this, starting with the fact that he is so in. Johnson is back in with the Lakers, as he has yearned to be for a long time. He is back in—the most in he's been since he owned 4.5 percent of the franchise and was Jerry Buss’ confidant. Johnson very well might actually be back in charge of Lakers basketball—even more than when he was the “Showtime” point guard and team leader in the 1980s. The coming months will determine, according to NBA sources, whether Johnson is part of a democracy expected to replace Jim Buss and Mitch Kupchak, or if Johnson singularly replaces Buss in charge of Lakers basketball operations—regardless of the general manager’s name. The latter scenario is a legitimate possibility, though for the moment, Johnson has only been hired to be Lakers president Jeanie Buss’ adviser. The very least is that Johnson will be a major player in all future Lakers decisions, according to sources—no mere figurehead or token big name. This move could be termed a crushing blow to Jim Buss’ chances of remaining in power if it weren't already so obvious that Buss’ siblings are prepared to move on from his time. This isn’t as much about Jim’s end as it is about Magic’s ascent. For all the shots he has fired over the years about Lakers mismanagement, Johnson has been tremendously patient in awaiting the moment when longtime friend Jeanie, most of her siblings and the Lakers fanbase saw Johnson’s value clearly. The Phil Jackson option is gone, Jim is reaching his self-imposed deadline, no free-agent savior players are on the horizon and even the Kobe Bryant lifeline has been severed. As Johnson said in an interview Thursday on Spectrum SportsNet, the Lakers’ TV network, he has passed up owning part of the Golden State Warriors, running the New York Knicks and advising for the Detroit Pistons. “I said no because I’ve always been a Laker,” Johnson said. “It’s up to every individual that works for the Lakers organization how they want to utilize my expertise,” Johnson said. It remains to be seen if that’s enough to satisfy Johnson, who has dreamed of having a larger voice as either an owner or executive with the Lakers, or if his overall empire keeps him busy enough not to want more Lakers power. Obviously Johnson will never be a day-to-day general manager, and the current expectation is that he wants more to be part of a group effort with Jeanie; her youngest brothers Joey and Jesse, who were groomed for more by their father and have had recent success in the organization; a competent basketball operations executive; and head coach Luke Walton, who will unquestionably have an increased voice in all Lakers matters. Anyone around the NBA interested in filling that basketball operations post should start polishing the resume, even though Johnson has been close with Kupchak for a long time. Johnson is said to have an open mind about dismissing Kupchak to usher in a new era, according to sources. Jeanie, Joey and Jesse were part of meetings with Johnson in advance of this decision—and sister Janie was informed along the way also. It was a great first day of meetings and lunch with @JeanieBuss, Linda Rambis and Joey &amp; Jesse Buss! Jim, meanwhile, knew nothing about Jeanie’s plans to bring Johnson aboard until shortly before the public announcement. One can only imagine the impact knocking the socks and even the baseball cap off Jim, who has been in denial about his standing and the likelihood of the Lakers turning things around on the court. One can only imagine how awkward Jim felt fielding a phone call Thursday from Johnson too. 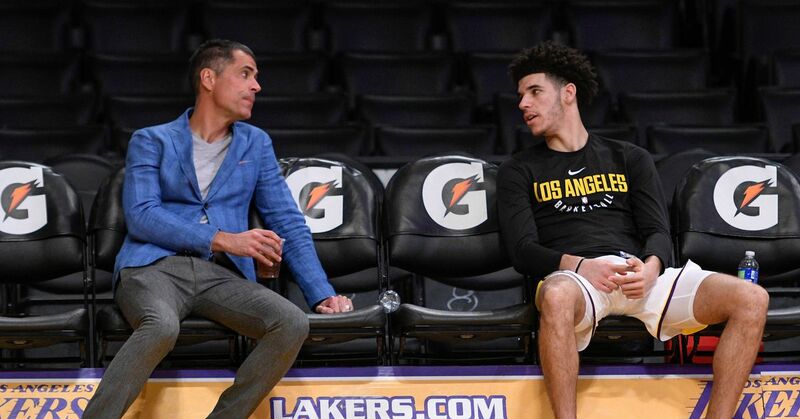 They’re the same age, 57, and have had a sort of unique sibling rivalry of their own under Jerry Buss…with Jim the favored son and chosen one, but Magic the pseudo-adopted son and franchise savior. Johnson provides a buffer for the Buss family, too, so the siblings can say Johnson’s review justified a front office change as opposed to them just firing their brother. The tentative plan for the Lakers is for Johnson to help Jeanie decide future moves, but what is largely misunderstood about the club’s hierarchy is that Jeanie does not need to fire Jim: Their four siblings—Johnny, Janie, Joey and Jesse—can vote on it. In any case, Johnson has been openly critical of Jim in recent years, and make no mistake, Johnson might even delight a little bit in cutting that cord. For Jeanie, despite her desire to defer to her father’s wishes and then her brother’s promise to have the Lakers in championship contention by this season, it’s impossible to miss how much more powerfully Johnson can reshape the Lakers’ future than Jim. Johnson has been there for key moments in the Lakers’ recent history—standing there in 2010 in the East Room of the White House with Walton, a player at the time, and Jeanie to celebrate the Lakers’ title with President Obama; being a part of the free-agent pitch meeting to recruit Carmelo Anthony; being the one on the Staples Center court to salute Bryant before his final game. Johnson has been there because Jeanie has wanted him there—and now it’s clear she wants him there more than ever. After years of being handicapped in free agency by Jim Buss and Kupchak’s withdrawn personalities, Jeanie can now offer truly magnetic salesmen in Johnson from the golden era and Walton from the current one. Even more important to Jeanie than that fresh energy, though, is that Johnson will open the door to Lakers basketball management—for both her and the public—in the way she prefers in the family business. Johnson is a master of communication. That can involve manipulation and shrewd timing—and that’s not meant as a criticism. He has mostly been a smashing success since his playing days because he has just as much magic in dealing with people and getting things done, overcoming his personal shortcomings. The Lakers need just that sort of balance, using Johnson to strike a bridge between the past and the future. The history still matters: The fact that the Lakers are playing the Boston Celtics on Friday stirs feelings on a base level…but hardly the way it once did. Johnson is here to inspire belief all of that can be brought back.